ModelTrain.com | Mountain Modelcraft | Build it Quick! The complete model landscaping kit. 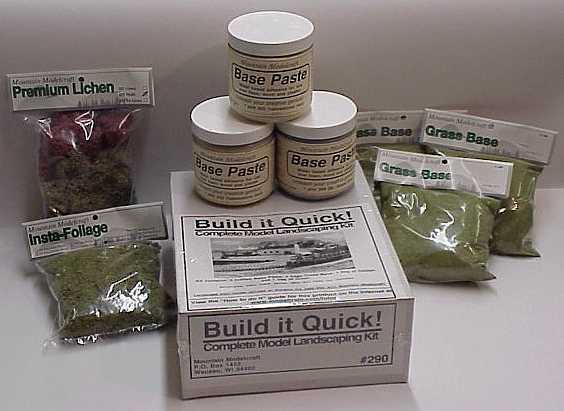 Our "Build it Quick" Kit is all you need to start landscaping your railroad. It contains 3 bottles of Base Paste, 3 bags of Grass Base, 1 bag of Insta-Foliage, 1 bag of Lichen and instructions on how to use the kit. Additional information is available online at http://tutor.modeltrain.com/ There you can find a very detailed tutorial and many pictures to help you get started in model railroading scenery. Price is $44.95. It is the EASIEST and QUICKEST, method available. Get it direct or from your local hobby store. To order your Build it Quick Kit click here.